Is Jordany Valdespin too valuable to start? 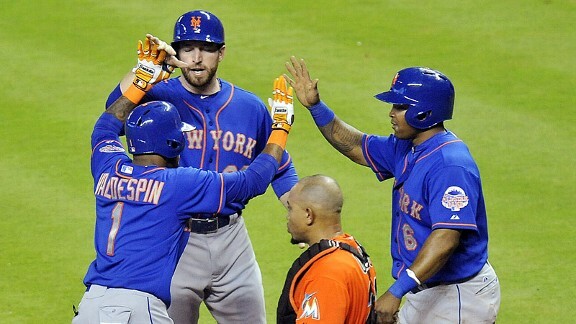 Ike Davis and Marlon Byrd greet Jordany Valdepsin after his critical pinch-hit three-run homer. MIAMI -- Too valuable to be an everyday player? The more success Jordany Valdespin has as a pinch hitter, the less often he might find himself cracking the starting lineup regularly -- even with the Mets’ desperately needing outfield contributions. Since Valdespin launched a walk-off grand slam last Wednesday to beat the Los Angeles Dodgers, the Mets had lost six straight games. That skid ended this afternoon, when Valdespin again launched a homer. This time, Valdespin produced a pinch-hit three-run shot in the sixth against right-handed reliever A.J. Ramos to stake the Mets to a one-run lead en route to a 7-6 victory against the Miami Marlins. So success means more playing time? Collins noted the value in being able to pick a spot to insert Valdespin as a pinch hitter late in games given his knack for rising to occasions. Valdespin had a franchise-record five pinch-hit homers last season. “One of those things with those bench players like that, you create the scene for them,” Collins said. “If he’s hitting third, he doesn’t come up in that situation. If he’s hitting first, he doesn’t come up there. All of a sudden, here comes the eighth hitter in a big situation. Here he is. Now you can put him in. As an everyday player, Collins said, Valdespin tends to change his approach at the plate. Maybe pinch hitting just suits Valdespin’s personality?